Microsoft’s next version of Office has reached its technical preview stage. The platform is being distributed to a select group of testers which for the first time includes customers; a public beta is due mid 2012. These quotes are taken from an article by Michael Sampson (@collabguy) talking about Outlook, SharePoint, and OnePlaceMail. It’s great to see that some of our guiding principles are shining through into the user experience. OnePlaceMail stands against the overwhelming complexity of SharePoint, helping users adopt those features most relevant to them and their work. One of the powerful value propositions of OnePlaceMail (other products do this too) is that it eliminates the version/migration headaches with SharePoint and Office applications. This add-on takes whichever version of Office a user has and marries it to whichever version of SharePoint the organization has. via One Way To Fix SharePoint’s Outlook Problem – The BrainYard – InformationWeek. Tags: inbound links, link analysis, Site Explorer, Yahoo! One question I’ve been asked countless times is the native integration options of Outlook/Exchange and SharePoint in order to save or transfer email and have it stored in SharePoint. Before I jump into the different integration options available it is important to consider that once you’ve got the email in SharePoint how easy is it to get access to? and have we lost any information in the process? Let’s face it, if we can get the email into SharePoint but can’t access it again easily what have we achieved? Each of the methods I’ll discuss have implications on how easy is it to access the saved email and how much of the email (including it’s attributes) can be accessed after it has been transferred to SharePoint. Treat the email as a file just like any other file that you would upload to SharePoint. 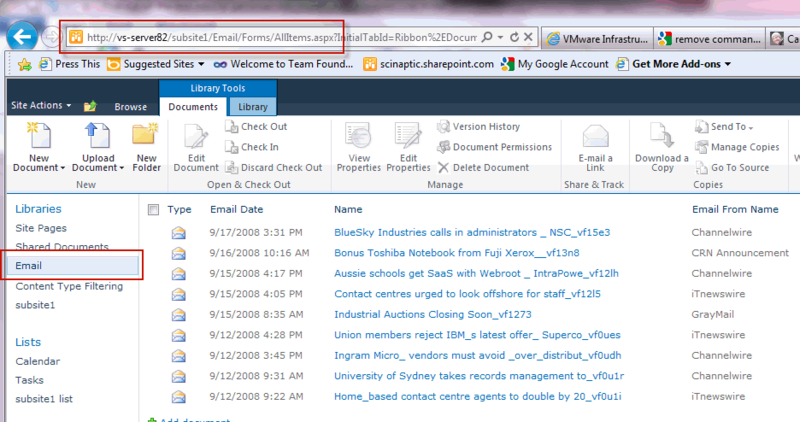 Now browse to the SharePoint list/library through the web browser and upload the file through the native SharePoint UI. Selected SharePoint lists & libraries can be enabled to receive incoming email on an email address that is unique to the list/library. Users can then include the email address of the SharePoint list with the recipients of an email to have the email stored in SharePoint. User cannot get the original email into SharePoint after the fact. That is, if a user receives an email they can forward it to the SharePoint list but it is the forwarded email that gets stored, not the original email as it was received by the user. It’s possible to map a network drive (or create a shortcut to a network location) to provide access to the content of a SharePoint library in Windows Explorer much like it is just another directory structure on a file server. You can now drag and drop email messages from Outlook into the Windows Explorer window and the files will be saved to SharePoint. If you are trying to do a simplistic transfer of multiple emails from Outlook to a single SharePoint library with no setting of SharePoint column values than this might be sufficient. I’d see it more as an ad-hoc or one-off technique to get you out of trouble rather than a technique to rely on day-in-day out. In the SharePoint 2010 Library ribbon there is an option to ’Open with Explorer’. This will open Window Explorer and display the contents of the current SharePoint library in an almost identical way the the previous technique of using a mapped drive. 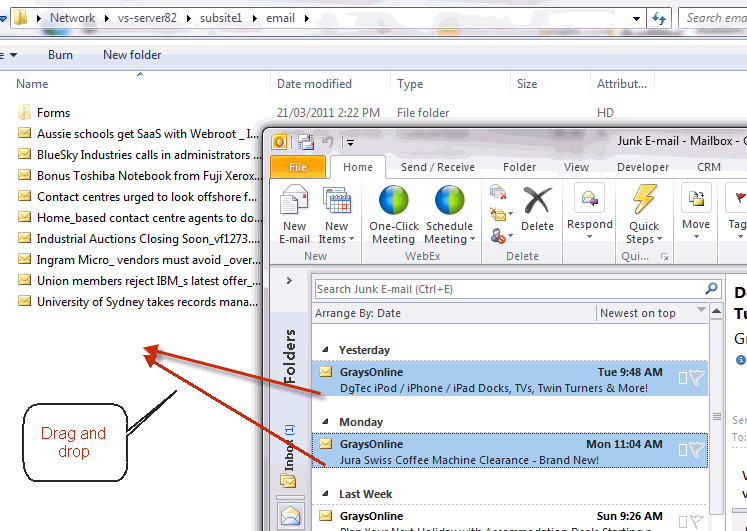 Again you can drag and drop email from Outlook into the Explorer Window. 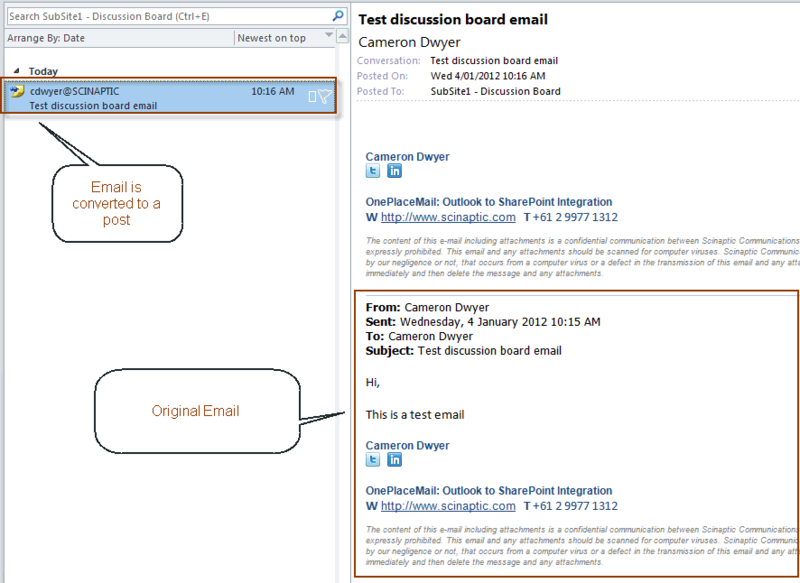 It is possible to connect a SharePoint discussion board to Outlook to obtain the ability to drag/drop email to the discussion board. From within SharePoint, open the discussion board you just created and click on Connect to Outlook in the ribbon. You can view the contents of the discussion in Outlook (emails are converted to posts). One gotcha is that if you have automatic signatures setup then the post that is created will have your signature added to it (just as though you forwarded the original email) – see screenshot below. I’m sure with some tinkering you could probably come up with a solution for this. If one of the techniques above fits your requirement then you are in luck and will be able to achieve Outlook/SharePoint integration natively. If you require more advanced functionality (such as automatic capture of email attributes to SharePoint columns, ability for user to tag or enter column values during save etc) then you are looking at 3rd party products or custom development. If you find yourself at this stage I recommend taking a look at OnePlaceMail. The Express Edition of OnePlaceMail is entirely free (no trial or evaluation period) and can be used by up to 25 users within a company. OnePlaceMail provides a far superior integration between Outlook and SharePoint/Office 365 than any of the native options and is built to address the lack (overcome the ‘cons’) of native integration options.